These are the best free Usenet trials to try when shopping around for a new Usenet provider. These are the best free Usenet trials on the market today. A free Usenet trial can be a great way to “try before you buy” and make sure a provider fits your needs before parting with your hard earned cash (or cryptocurrency). Of course, not all providers offer free trials. That’s why we’ve assembled this list of the ones that do! They are listed generally in order of most generous, either by length of time and/or amount of data. One of our favorite Usenet providers also has one of the best free trials. At 15 days, Newsdemon’s free Usenet trial is the longest we’ve seen, and it’s 50 GB cap is more than enough to keep most users busy. XSNews is another solid provider with an excellent free Usenet trial. It’s a day shorter but comes with uncapped data, which is unheard of for such a long trial! XSNews is based in the Netherlands though, so it’s best for European users. Check out XSNews' free Usenet trial. Newshosting’s free Usenet trial is just a tad less generous than NewsDemon’s, but is one of if not the best free Usenet trials on the market today! Especially considering Newshosting is rated as our overall best Usenet provider. Want to try one of the fastest Usenet providers around – for free? Then UsenetServer’s free trial is perfect for you. 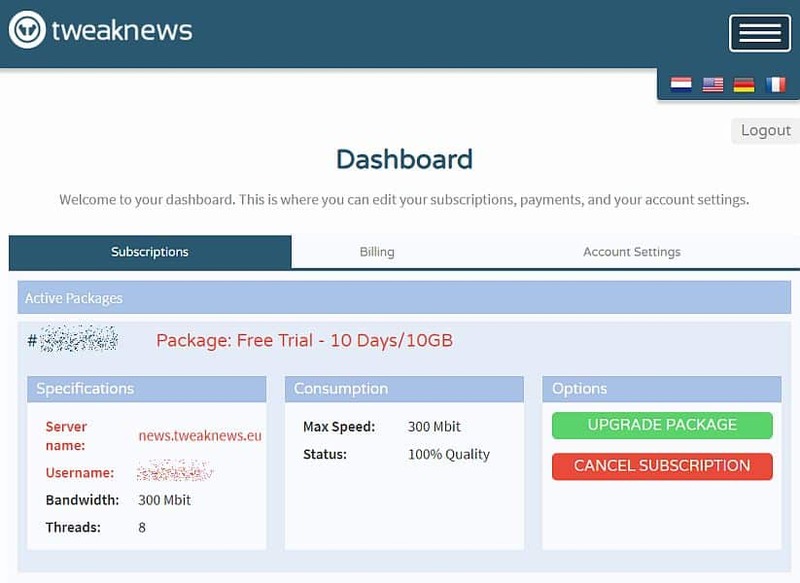 Giganews is a premium Usenet provider, with all the bells and whistles that come with it, so Giganews' free Usenet trial that’s worth checking out. EasyNews is one of the most popular Usenet providers on the market today, and you can try it free for 14 days or 10 GBs, whichever comes first. Check out the Easynews free Usenet trial. TweakNews’ free Usenet trial isn’t the longest in terms of days, but it’s one of the best Usenet trials you can get. There is a 10 GB limit on the amount of data you can download during the free trial and download speeds are restricted to 300 Mbit. Plus, you can access the free trial without a credit card which makes this deal even sweeter. Although no credit card is required, you will be asked for a telephone number that can be verified by SMS/text message. TweakNews' free Usenet trial (select to zoom). UsenetBucket actually operates on the XSNews backend, but unfortunately it’s free trial isn’t as robust. Of course, it does have one advantage over the XSNews trial: no credit card required! Give UsenetBucket's free Usenet trial a whirl. What PureUsenet’s trial lacks in length it makes up for with its uncapped data and no speed throttling. PureUsenet is based in The Netherlands and you only need an email address to sign up. Try the PureUsenet free Usenet trial today. Eweka is another Netherlands-based provider with an uncapped 7-day free trial. Some people prefer it slightly to PureUsenet, but it does require payment information, like a credit card, to take advantage of the trial. SuperNews offers a short and sweet free Usenet trial that’s great if you just need to download a few things – or a quick binge. Usenet.Farm is a newer Usenet provider and it’s free Usenet trial isn’t the most impressive, but the good news is you only need an email address to sign up (no credit card info is needed)! Not Sure Which of the Free Usenet Trials to Choose? If you’re still not sure which trial is right for you – or which one to try first – we’ve got some great resources on our best Usenet provider and a comprehensive Usenet comparison table that can help you make up your mind. And remember, most trials require you to cancel before the trial’s over if you don’t want to be charged. So, if you don’t like the provider or don’t want to subscribe long-term, remember your trial end date and cancel before it ends! Tweaknews requires a credit card. Thanks very much for your comment, Adam. After receiving your comment, we immediately signed up for a TweakNews free trial to check. The free trial signup process did NOT require a credit card, but it did require a telephone number that had to be verified by SMS/text code, https://www.tweaknews.eu/en/signup/phoneverification. We will add this information to the post above.